The T-80 tank is seen here during a show of modern and prospective weaponry at the Army 2017 International Military-Technical Forum, Moscow Region. 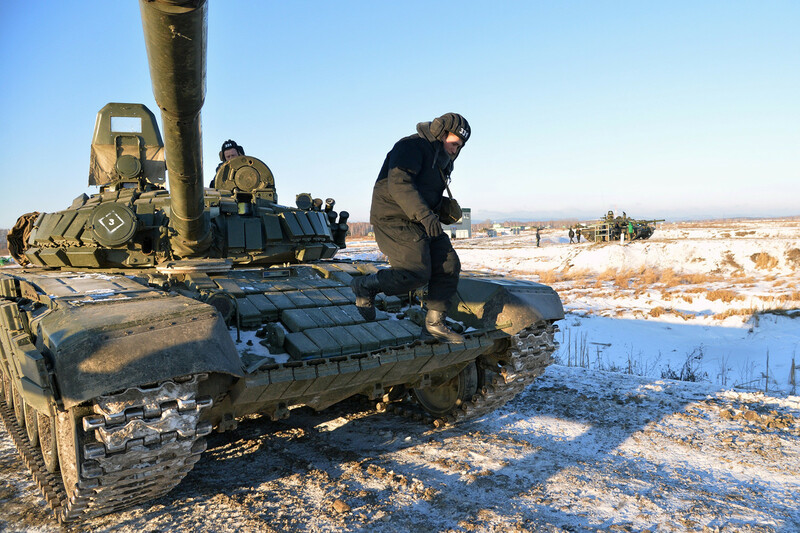 T-80 tanks with jet-propulsion engines have been gathering dust in army depots since the collapse of the Soviet Union. But to meet objectives to do with the development of the Arctic and security in that region, new armaments were needed - and instead of developing new models the Defense Ministry decided to upgrade existing ones. Uralvagonzavod (Russia's monopoly tank maker) has been working on the modernization of the T-80 tanks for the last six months. Prior to that the company signed a contract with the Defense Ministry for the supply of the upgraded machines. On March 15 the ministry took delivery of models of the T-80 ready for service in the coldest regions of the country in the Far North. With the beginning of the opening up the Arctic the Russian army has faced the need to defend the country's frontiers from a new direction. Instead of investing billions to produce new equipment and drain the state budget with extra spending, the country's leadership decided to invest in the modernization of existing "dormant" equipment. Tank troops form the basis of the Russian army; the country currently has around 18,200 tanks of different types. Designers have managed to deal with the key shortcoming of the T-80 tank - its voracious appetite for fuel. Over the most demanding terrain it could consume as much as 2-4 times more fuel than the diesel-powered T-72. Now fuel consumption has been reduced to the level of the T-72 thanks to the simultaneous start-up of the engine and the generator. In simple terms, the designers have altered the engine to function in idling mode. The jet-powered engine that was fitted to the T-80 models of the late 1970s operated at full throttle both at top speed and when standing still. The T-80 tank at the Chebarkul shooting range outside Chelyabinsk during a demonstration session of the newly formed 90th Vitebsk-Novgorod two-times Red Banner guards tank division. The tank's gun has been given modern thermal imaging and laser systems that increase its combat effectiveness at any time of day or night. The machine's armor has also been covered with dynamic protection layers, and the crew compartment has been adapted to temperatures down to -40 Centigrade (-43.6 Fahrenheit). The 125 mm gun itself is unchanged, as are the large-caliber machine-guns fitted to the turret. 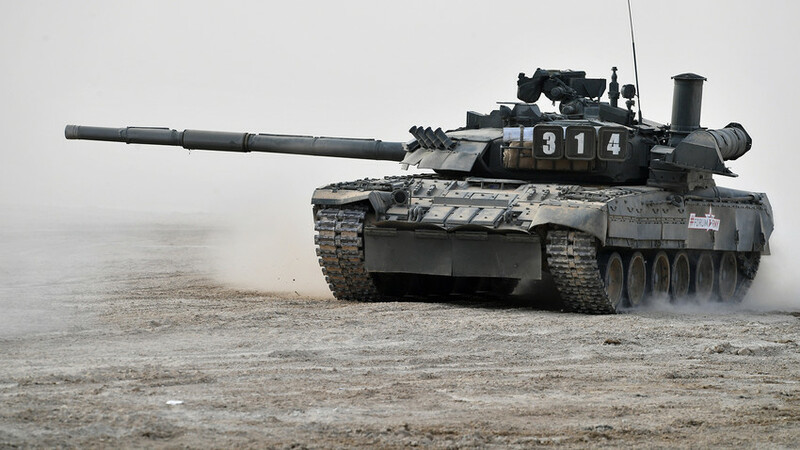 The T-80 was launched in the mid-1970s and was the first tank in the world to be fitted with a gas turbine engine instead of a standard diesel unit - an engine similar to those used in aircraft. Because of it, the sound of a T-80 racing around a military test ground is like the roar of a fighter plane accelerating on a runway. The armored giant with its gas turbine engine had many advantages over its contemporary cousins. In contrast to diesel, it was ready for operation three minutes after start-up and not 30 minutes as in the case of the T-72. The T-80 has a range of 270 miles on a single fuelling. Furthermore, the new engine gave the 40 ton tank advantages of speed and manoeuvrability. At the time, the T-80 was the first domestically produced tank that could hurtle along rugged terrain at speeds above 40 mph. Today only the new Armata can boast a similar capability. During the "Cold War" and arms race, a high-speed tank of this kind was regarded as a first-strike weapon - all 4,000 T-80s were deployed on the Soviet Union's western borders in East Germany and Eastern Europe. In the event of war, they were to cross Europe and reach the English Channel in the course of a few days. And since the voracious steel giants could be "fed" on any type of fuel, it was planned to deal with fuel shortages "as they went along" - by resupplying them from European petrol stations, industrial plants and military units. But with the start of perestroika and the collapse of the USSR in 1991 the need for such a high-speed army and plans for hypothetical combat operations in Europe simply disappeared. As a result, the majority of the T-80s ended up parked in storage sheds gently rusting. Until recently, that is.